Minnesota mudrooms vary in size, type and style. What’s great about all of them, however, is that they bring value and function into the home. Throughout our time designing and installing a variety of custom mudroom storage options, we have come to favor a few unique design ideas that help to make the most of any mudroom. Two of the most common types of Minneapolis homes are split-level houses and one-and-a-half-story houses. If you own one of these homes, then you likely covet the idea of finding the perfect space-saving mudroom option. We believe we have found the right one you. Use the space under your stairs! Instead of building out a bank of cabinets or locker cubbies into what is often a cramped space, you can build directly into the wall. This saves you valuable walking room while also increasing easy access hang up your coats, purses, backpacks and hats. Storage under the seat: You can add a great deal of hidden storage space when designing a bench with a seat you can lift. This space is ideal for storing seasonal items such as winter gear and gardening gloves. Open sections for bins and baskets: You can achieve the ideal locker room cubby look by building in separate sections, or cubbies, for each family member. You can build them in directly underneath the seat for easy access. 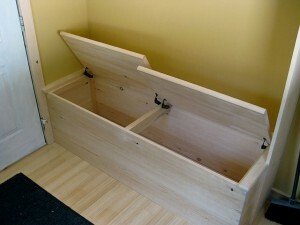 Built-in sections for shoes: You can either build in separate cubbies for individual pairs of shoes, or you can leave the very bottom of your bench open for storing shoes underneath it. Pull-out drawers and cabinet doors, along with coordinated bins and other closed storage options can keep an otherwise cluttered space clean and inviting. Using a mixture of all three provides the added bonus of ensuring your mudroom isn’t just a bank of wall-to-wall cabinets. In this way, you maximize your mudroom storage options without sacrificing style. What Are Your Favorite Mudroom Storage Options? So what do you think? Would one of these options (or all of them?!) work out for you? Or do you have some other creative ways to increase storage space in your mudroom? We’d love to hear from you in the comments section below. Or, give us a call at 952-737-7088. 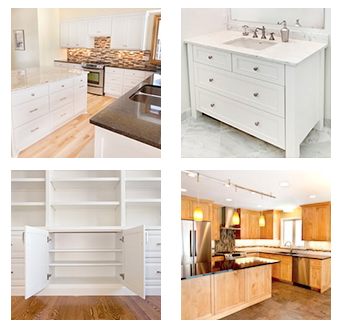 We can talk to you about your design ideas, as well as explain how we can design custom-made cabinetry for your new or upgraded mudroom. Photo credit: Some rights reserved by Rick Scully.